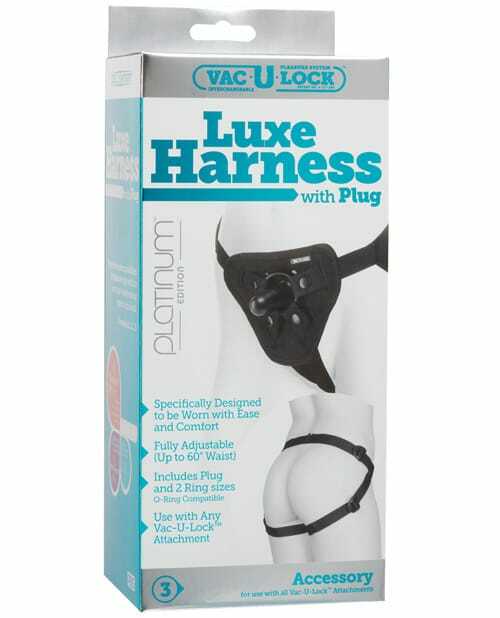 The Vac-U-Lock Platinum Edition Luxe Harness with Plug Black is sleek in design, with simple lines and a comfortable construction. Easily adjustable up to 69 inches, with pull to tighten straps, open crotch and rear, and a snap front for swapping out attachments. The Vac-U-Lock Platinum Edition Luxe Harness is made of smooth black neoprene, the Luxe works with all Vac-U-Lock attachments as well as strap-on compatible toys. Includes two O-rings. Designed for use by women and men. Washable. Dimensions waist sizes up to 69 inches. Body safe materials. Phthalate free.